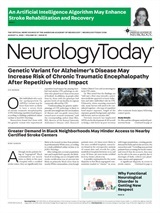 In the February Neurology Today, this column discussed how neurologists use personal digital assistants (PDAs) to generate prescriptions and access medical reference material. Part 2 of this series focuses on their use in clinical and hospital settings. If you have additional questions about issue you'd like to learn more about or you would like to share how you are using technology in your own practice, please e-mail your ideas and questions to neurotoday@lww.com. In the office, computers can easily generate prescriptions and provide access to a wealth of medical reference material. But the place where size really matters and personal digital assistants (PDAs) provide a striking advantage is in the hospital. Not only are handhelds more practical by virtue of their portability, they are also superior when time is of the essence and care needs to be provided expeditiously. Just how are PDAs being used in emergent situations? Neurologists active in stroke research at the Erlanger Medical Center Emergency Heart and Stroke Center and Memorial Hospital in Chattanooga, TN, are using handhelds to expedite the process of qualifying patients for clinical trials in the emergency room (ER). When a stroke patient arrives in the ER, nurses use their handheld computers to reference the criteria of various research trials. Tom Devlin, MD, PhD, is the Medical Director of the Regional Stroke Center at Erlanger Hospital in Chattanooga, TN. He and his research associates are engaged in 10 active clinical trials. The protocols have differing windows of time and criteria for inclusion, and he emphasized that “everything has to happen very, very fast” in order to segregate patients appropriately. When a patient arrives, a stroke beeper alerts Dr. Devlin as well as the neurologist and clinical research nurse on-call. The nurse refers to her PDA for information, such as the NIH Stroke Scale and inclusion criteria for use of intravenous t-PA, and additional neuroprotective drugs or new types of treatments. After reviewing relevant patient demographics, comorbid disease history, and laboratory data, the stroke team determines if the patient can be included in a study. It can take as long as 45 minutes to select the appropriate study, explain the clinical trial to the patient, obtain informed consent, and get the patient randomized into the trial, Dr. Devlin said. Using a PDA, he added, can cut 10 to 15 minutes from this process, eliminating the need to search through a mass of paperwork in a busy emergency room. At their regular Monday morning meetings, Dr. Devlin said neurologists leave their PDAs outside the conference room, allowing nurses to beam protocol updates to the doctors' devices. In addition to performing clinical trial overviews, the nurses update telephone numbers and other contact information and changes. Dr. Hier also serves as the physician adviser to the Information Technology Services department at the 600-physician medical center. He is exploring plans to expand the use of PDAs in the future. Dr. Hier is interested, for example, in implementing a system in which physicians can view portions of UIC's electronic medical record (EMR) system on their handhelds. Dr. Hier has recently completed a one-year study of faculty and housestaff attitudes towards EMR and feels that the key factor that determines adoption of technology is whether a product “saves time.” He believes medication databases provide a good example; it is simply more expeditious to look up the dosage of a drug using a PDA than a Physician's Desk Reference. Since handheld devices so readily incorporate databases of medical information, why can't they be used to incorporate financial and administrative information? In fact, several commercially available products have been created for the explicit purpose of improving practice management. By offering charge capture features, they help with coding and billing and ensure accuracy for reimbursement. They provide a solution for lost billing charges, a significant problem when physicians try to track in-patient services on pieces of paper or index cards. In addition, by incorporating E&M coders and ICD-9 tools with rules of medical necessity, some products can reduce denials due to inaccurate or incongruent charges. This information is synced with the practice management system to ensure timely processing of claims. The billing staff no longer wastes time attempting to determine which code the physician has circled on a paper list or entering this information into the billing system. Dr. John Halperin, Chairman of the Department of Neurology at North Shore University Hospital in Manhasset, NY, has been using a charge capture program on his PDA for in-patient billing. It works with the hospital's computer to download the entire census. Numerous sync cradles are conveniently located in their offices, the emergency room, and all entrances to the hospital. Dr. Halperin selects his patients from the master list, assigns each encounter a CPT code, adds a GC modifier if seen with a resident, and links it to an ICD-9 code from a predesigned list of neurological diagnostic codes. When he syncs again, this information is automatically entered into the charge system. Follow-up visits are even easier to record since the previously selected information is readily available. Dr. Halperin is clearly enthusiastic about the results. “This system has clearly paid for itself financially and in terms of efficiency and convenience,” he said. In fact, he cited an internal study by his institution, which demonstrated a reduction in hospital lag days of billing by more than a week. In addition, there was an increase of 10 percent in overall charge efficiency from the prior days of manual billing. Dr. Halperin believes PDA are exceptionally user-friendly and can even appeal to the most technophobic neurologist. He noted that one of his colleagues avoided his in-office computer for three years, but quickly adapted to the PDA – in two days. He said that the hospital began the pilot PDA project in March of 2001 as a three-month test. At the end, most neurologists did not want to give up their handhelds. It is not a simple process since it would require two incoming interfaces and one outgoing interface. This is perhaps the biggest hurdle in health care information technology today. Disparate systems need to communicate seamlessly in order to be truly efficient and ultimately appealing to health care providers. But as more applications become readily available, physician interest will likely steamroll this exciting market.